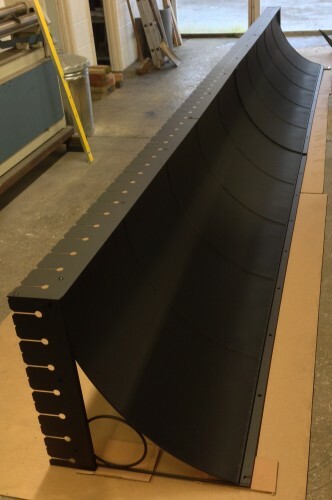 The teams at Garden Requisites recently worked on an impressive bespoke 10’ canopy for a smart London townhouse, likely to be in place for over a hundred years. This project really brought it home to us what a responsibility we have to use traditional metalwork skills to help preserve and maintain the fabric of buildings of historic importance. Such details, in the renovation of old places and designing of new places, have seem something of a resurgence in recent times. Time and care is being taken to replace and renew with just as well-constructed structures as those made in the past. Heritage metalwork is all around us in the UK – in every city, town, village and hamlet. 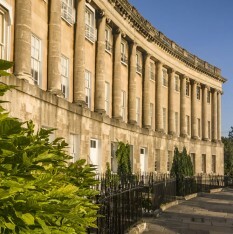 We can see it celebrated in the Georgian crescents of Bath, in Edwardian enclaves of London, in the Victorian terraces of many seaside towns and far beyond. When you’re next walking along a street or crescent of period town properties or visiting an old country house or cottage, take a closer look at the old metal, architectural embellishments of these well-constructed buildings. Practical purpose meets pleasing adornment in every balcony or sheltering canopy. Some features may be looking a little derelict and worn, some renewed and renovated. Maybe you, yourself, are the custodian of some classic Georgian, Victorian or Edwardian ironwork. These architectural extras really add to the character of a historic building and sometimes lend added support to attractive climbing plants. We like to reference them and reinvent them so that hand-crafted metalwork can be celebrated for many years more. If you’re interested in heritage houses, renovation and restoration, it’s really worth following the Exploring Architecture series over on Houzz for ideas and expert advice. 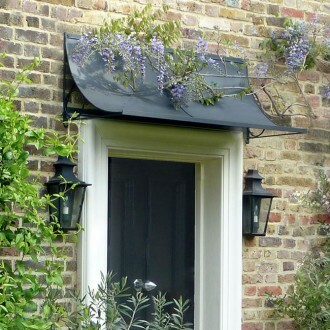 Door canopies can feature in a variety of different situations. As well as improving a building’s frontage, they can look really smart running along the length of French patio doors that lead on to a garden or create a cohesive look over doorways for a series of buildings that are close to each other i.e. a group of outhouses. Well-made, bespoke door and frontage metalwork can be hard to come by. Any replacement canopies or covers must be sturdy and safe, well-measured and installed with high quality fixings. We find that our iron and zinc galvanized steel canopies are used for all types of property – to add interest and enhance a sense of handcrafted in contemporary buildings as well as reviving and renovating heritage structures. Some super-smart finishing touches can really pull the look together and bring a fascia to life too. Consider metal planters and window boxes with crisply clipped topiary and trellis panels for well-held climbers. Et voilà!